The two points at stake last night were of great importance to the Penguins. Their regulation win against the Hurricanes has put Pittsburgh in a great spot to get a favorable first round matchup. The New York Islanders are up to 75% and that is a good thing. Even better is seeing that Tampa Bay percentage drop all the way to 3%. A win by Carolina last night and this map would have looked a lot different. Pittsburgh got yet another great performance from Matt Murray in net. He stopped 37 out of 38 shots. It was another game where the Penguins did not own the shot attempt share at even-strength. Murray has been hiding some of the warts in the recent games against Nashville and Carolina. The fourth line chipped in with a goal. Adam Johnson’s speed earned him a clean puck retrieval and a below the goal line pass to Matt Cullen who hit Garrett Wilson streaking in the front of the net. It is a nice bonus when you can get a goal out of this line and came at a great time. This goal is courtesy of Brian Dumoulin. His ability to defend the blue line and not back in created the break in transition for Matt Cullen. The 42 year old center might not be able to create time and space for himself anymore, but if he does find some he can still make a few plays. It’s just tough to create that much space for him on a consistent basis. Great job by Dumoulin. The third line was rewarded with a goal. Territorially they’ve been great and not scoring a ton. Even better was Patric Hornqvist getting on the board with a 5v5 goal for the first time since January 6th and the first one since he missed time with his second concussion of the year. Dominik Simon utilized his speed and was able to slip by the Carolina defender. It was a classic Hornqvist shooting goal. He likes going far blocker on those mini one-timer plays. In the not so great department we have some regression trends surfacing. I’m not a huge fan of using five game rolling averages, but when your sample is 16 games you use what you have. What should we make of this information? 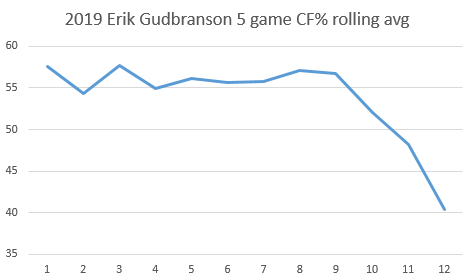 I think you need to think about how you deploy Erik Gudbranson moving forward. We have 464 game sample with a lot of it being bad. The problem with how the Penguins have their pairings right now is you need to shelter Gudbranson and Johnson-Schultz. You can only realistically shelter one pairing at a time so one of them is going to be exposed. I would start to get concerned if this trend continues against lower tier teams like Detroit and New York to close out the year. Sidney Crosby will need to average over a point per game to hit 100 points. Crosby has 94 points and three games to go. He’s Sidney Crosby so it can be done, but he only has one even-strength point in the last eight games and two points total. . Since Letang was lost to injury again Crosby's Jack Johnson time has gone up. Funny coincidence I’m sure. It’s worth keeping an eye on practice today. Will Evgeni Malkin and/or Kris Letang have a normal practice jersey on? If not they will miss tomorrow’s game for sure. It would be nice for each of them to get a game in before the playoffs begin. Being injured and jumping into the playoffs isn’t ideal for any player, but I suppose Malkin has experience doing it. Alexander Ovechkin scored his 50th (and 51st) goal of the year over the weekend which makes it eight times he’s accomplished this feat. For me it is between him and Mario Lemieux for best goal scorer of all-time and the trajectory Ovechkin is on will likely lead him to being my clear cut answer. The only other players that have more 50 goals seasons are Wayne Gretzky and Mike Bossy with nine each. The big difference for me is that Alexander Ovechkin actually had to score on real goalies. Early 80’s Youtube highlights are cringy to watch. The goaltending and defense was remarkably pathetic.